In recent years ‘retro’ has been a consistently popular buzzword in areas ranging from furniture to fashion to food. Jargon aside the rediscovery and often reinvention of food classics has generally been a good thing. I have touched on this topic before on the post entitled ‘Living in 70’s or the theory of eternal recurrence’ from March 2011. The other day I was reading a book called Recipes My Mother Cooked which includes recipes from the mothers of well known food identities including Maggie Beer, Damien Pignolet, Ian Hemphill and Jill Dupleix among others. 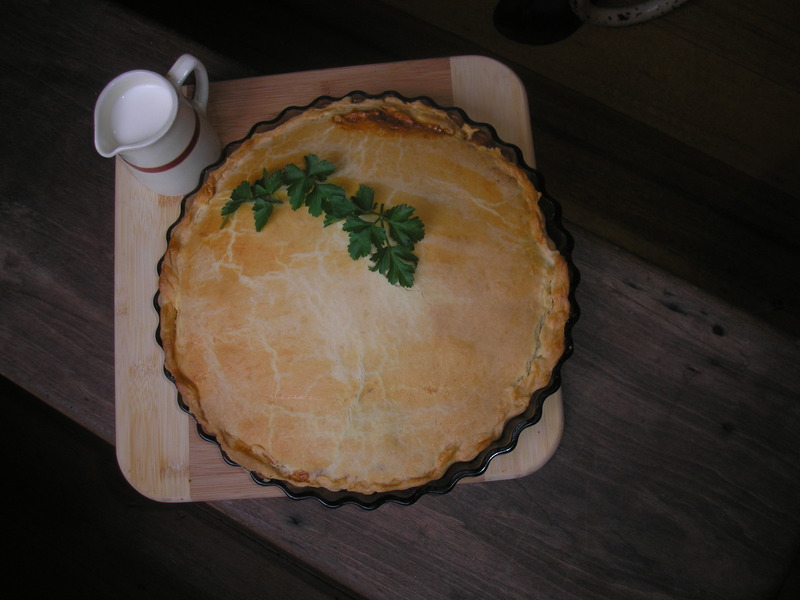 I had just returned from my parents’ place in the country with some beautiful freshly laid eggs that they had given me so it was the recipe for ‘Old-fashioned Egg and Bacon Pie’ from Jill Dupleix’s mother, Rosemary, that caught my attention. I kept the recipe pretty basic but I added some shredded spinach, finely sliced spring onion and freshly grated Parmesan just to give it a bit more colour and flavour, these additions are optional. I also made my own pastry but it is fine to use frozen puff pastry sheets if you wish. Preheat the oven to 190°C. Line a lightly buttered 22 or 23cm pie dish with pastry, patching to fit as necessary and allowing it to overlap the edges. Chop the bacon and fry in a dry frypan until lightly cooked. Set aside to cool. Whisk 6 eggs with the milk, parsley, nutmeg, Parmesan, spring onions, sea salt and freshly ground black pepper. 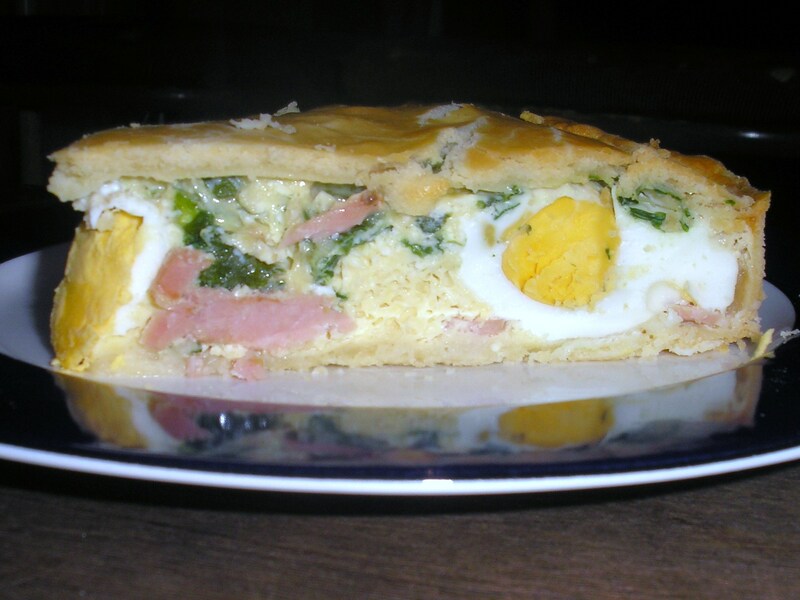 Arrange half the bacon and half the shredded spinach on the pastry and pour on the egg mixture. One by one, crack the remaining eggs into a cup and gently slip into the mixture. Top with the remaining bacon and spinach. Brush the pastry rim with the extra beaten egg and lay the remaining pastry over the top. Crimp the edges with your fingers or the tines of a fork and trim off excess pastry. Brush the top with beaten egg and bake for 15 mins. then reduce the heat to 170° C for a further 25 – 30 mins or until golden brown. Leave in the dish to cool for 30 minutes before removing. Allow to cool to room temperature before serving. Note: if using the home made pastry you will probably only need about 2/3 of the quantity made. Save the other 1/3 for something else.